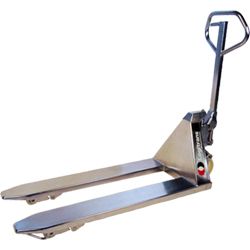 Stainless Steel Pallet Trucks | 5,500 lbs. Cap. INOXPLUS-2048 20.5" 48" 5,500 lbs. INOXPLUS-2748 27" 48" 5,500 lbs.